I'm not a REGULAR on Smogon, I don't really post on the forums much or anything, but I do familiarize myself with all the smogon strats. My team consisted of Swampert, Gengar, Kingdra, Lucario, Metagross and Forretress. ...I won! 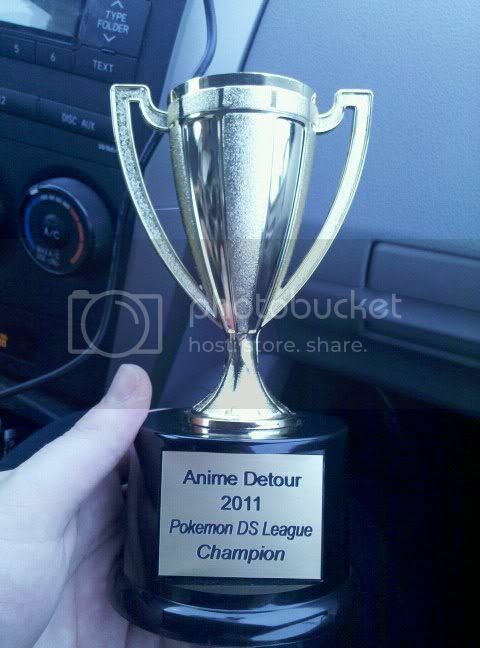 Going back to defend my title next year. I've got my ticket. I'm stoked. I'm definitely going. Got my ticket preordered and everything. I'm definitely playing. I also got into the beta, and it's stunning. I'm going Lancer and then transitioning into Archer. Topic: Book cover progress/lack thereof, other ramblings etc. Re: What to put behind them...? Aaah, yeah, I like that one a lot better. The other one was good too, but this fills up a lot more space and the character expressions come out really well. I dig it. I liked it, except for the fact that the last boss isn't who it should be. It's like, "Whelp, you just beat the main antagonist throughout the game... BUT WAIT! New super secret bonus boss!" ...Really? GhaleonOne wrote: I finally saw this the other night. Is it possible to hate a movie but think it was good at the same time? It was so freakin' depressing, but at the same time, it was a good movie. Grave of the Firelies. 'Nough said. Closes it perfectly. Every question you have ever had from any of the other games is resolved flawlessly. Pfffft. Are you a fan of the earlier installments? If you hadn't played them, then this game would be terribly confusing. But it's honestly insulting hearing that considering how highly I praise it. XD I thought it was absolutely phenomenal. A K-On. May the fanboys screams for moe be answered. The Leviathan is an underwater fortress if I remember correctly. I believe Myght brought up building a submarine for Dyne and company. But yeah, that's just one example of possibilities.